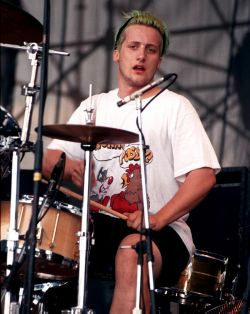 Tre Cool, real name Frank Edwin Wright III, was born on December 9th, 1972. He grew up in the Mendocino mountains with his father and 2 siblings. Tre's nearest neighbor was the founder of Green Day's first record label, Lookout! Records. When he was 12, Tre joined his first band, The Lookouts. They recorded an album and played regularly in the area. When John Kiffmeyer left Green Day, Tre replaced him as their permanent drummer and has been with Mike and Billie Joe ever since. In March 1995, Tre and his girlfriend, Lisea Lyons, got married and had a daughter, Ramona, on January 12th, 1995. They have since then divorced but still keep in touch. Tre remarried his new wife Claudia in 1999 and they have a son and daughter together.